We’re in the midst of the dog days of summer here in Florida, which means we’re relying on our air conditioners to keep us cool on a daily basis. If you’re like most people, you likely don’t think that much about your air conditioner — that is, unless it stops working. You can ensure your system keeps working with regular air conditioner maintenance, but that’s not all it will help. 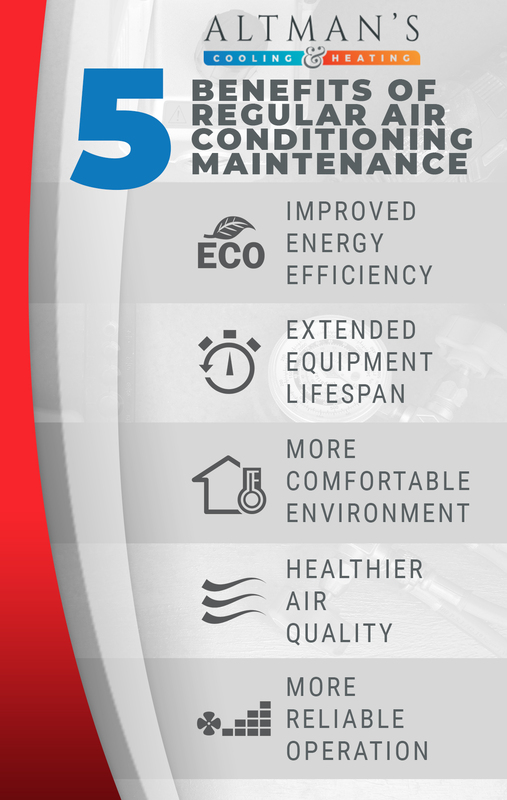 Today, we’re going to take a look at five of the benefits of regular air conditioner maintenance. Want to make sure your system is working properly? Call Altman’s Cooling & Heating in Titusville today to schedule your appointment. Many households are looking for ways to reduce their monthly energy bills. Your air conditioner has a lot of impact on your home’s energy efficiency. When an air conditioner isn’t maintained, it will run inefficiently. When you get your AC serviced by an HVAC professional, they’ll ensure your air filter isn’t dirty, your ducts aren’t leaking, and your motor is operating properly. All of this will help to ease your energy bills while you stay cool. An air conditioner typically has an expected lifespan of about 15 to 20 years, but that requires regular maintenance. If an air conditioner is not consistently maintained, it will begin to break down, resulting in costly repairs or requiring a complete replacement. This is because your system will overwork itself in an attempt to compensate for any issues it’s dealing with. While the expected lifespan may be 20 years, it can be extended through regular maintenance because an HVAC professional will be able to catch problems before they cause any permanent damage. When an air conditioner is regularly maintained, it won’t just save you money and operate optimally; it will also help your home be more comfortable. You won’t have to worry about loud noises from a malfunctioning AC unit bothering you as you try to relax. Studies have shown that cool air can help us sleep better at night as well, so your air conditioner has a big impact on your home’s overall comfort level. An important piece of your home’s comfort levels is the quality of the air inside. A dirty air filter will cause your home to be filled with particles, pollutants, and allergens that can make you sick and miserable. Air conditioner maintenance will keep your indoor air quality clean and fresh. Consider a HEPA air filter to make the air quality in your house as clean and healthy as possible. Depending on your system, air filters should be replaced or cleaned every month to every three months. There aren’t many situations worse than your air conditioner grinding to a halt in the middle of a hot summer day. Regular air conditioner maintenance will ensure it works well throughout the summer so you can stay cool and enjoy your day. Don’t risk having to replace your air conditioner by ignoring maintenance. Keeping your air conditioner working throughout the year is incredibly important, especially in a state as hot as Florida. If it’s been a while since your air conditioner has been inspected, call Altman’s Cooling & Heating to schedule your appointment. While we’re located in Titusville, we’re happy to serve Merritt Island, Port St. John, Cocoa, Cocoa Beach, New Smyrna Beach, Cape Canaveral, Mims, Rockledge, Sharpes, Wedgefield, Edgewater, and Oak Hill. Don’t put off your home air conditioner maintenance. Rely on an HVAC professional that you can trust. As a special offer for new customers, we’re offering $30 off any repair during normal business hours. Call us today to learn more!